Enjoy the convenience of FREE Pick Up and Delivery today! You work hard, you play hard, you live a full life! There’s just not enough time to do “everything”. Tired of Laundry rooms always busy or down right dirty? Fed up with not finding parking at local laundromats? Not comfortable with those who just "hang out" at the laundromats? You have “Special Needs” or a temporary disability? 5 Minutes could save you 5 hours of time, plus gas and hassles! >>> Currently Serving: All of San Diego Central. Including La Jolla, University City, PB, OB, Downtown, Banker's Hill, Hillcrest, North Park, South Park, University Heights, City Heights, SDSU (College Area), Clairemont, Linda Vista, Mission and Fashion Valley, Basically from Highway 52 down to Highway 94 and from the Ocean to Highway 125. Now serving: National City, East County; El Cajon, La Mesa, Spring Valley, Lemon Grove (let us know if you are not on our map). 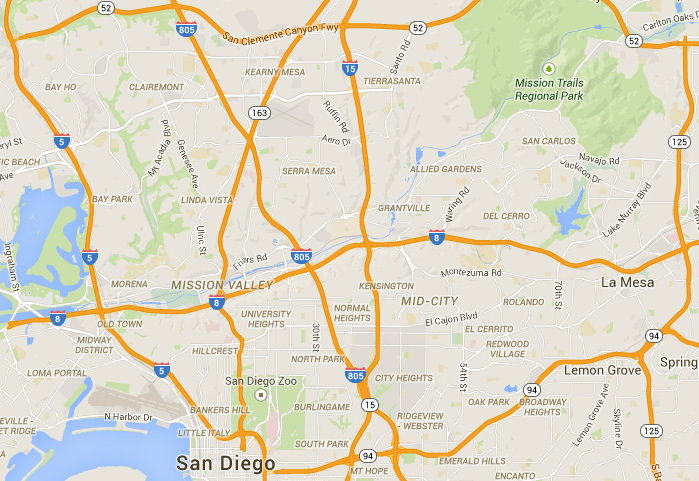 Please call us at 619 723-7517 to see if we are now in your area. Our Professional Wash-Dry-Fold Service is convenient, affordable and professional! “5 Minutes could save you 5 Hours or MORE!” We use our supplies, saves your gas, parking hassles & saves you time and money –and we still use high quality detergents, bleach and softener! (We accept “wet” orders and then base the price on completion of service. * Wash, Dry and Fold is priced per pound. Ask for your rate here. Wash | Dry | Folding and/or Hanging | Packaging for delivery! Please ask about any special items. We will come to your home/work and weigh your items, give you a FREE estimate. No obligation! * Wash, Dry and Fold is priced per pound. Minimum 20 pounds. Do you hate doing laundry? Or can’t get your laundry done? Dakota is your answer. He’s a life saver. He picks up and drops off your laundry, processes the laundry to your specifications (cold, hot, soap, dry, air dry, etc), hangs or folds, even hangs the items on your own hangers, and his price per pound is so reasonable. This is a great service if you’re injured or just simply can’t do the work yourself. It is pricey, but you get everything back folded perfectly, hung on hangers, and smelling great. If you have the money, I say A+ service. I was severely injured and couldn’t walk and it helped me out a bunch! Obsessed with this service. I truly am a workaholic and these guys are so awesome and work around my crazy schedule to pickup and drop off. And I can literally say I’ve tried EVERY fluff n fold in a 10 miles radius and this is by far the best. Very friendly service, super easy, come exactly on time, and beautifully done folding. This could be a total life-changer! Thank you!